My mum’s celebrating her birthday this week. And, for the first time in years and years, I won’t be there for the festivities. As long as Hubby and I have been together we’ve made the trek down east in August. With the exception of this year, and two other years when we went home in July for different celebrations. This is a shot taken at Mum’s 65th birthday party. 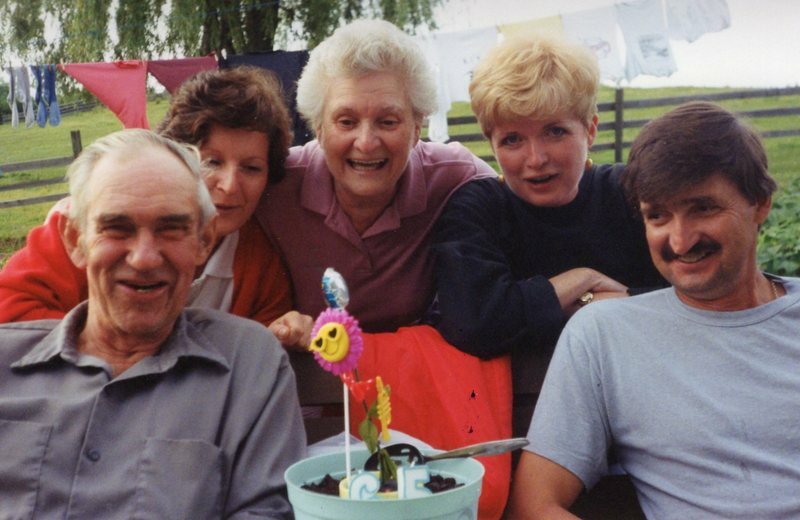 That’s my stepdad, my sister Connie, Mum, me, and my brother Terry. We’re all laughing at the dancing flower in the cake my sister made for Mum. Every time someone laughed the flower danced and sang. The cake was made in a big plant pot, with Oreo cookies for the “dirt,” and even a handy spade to “dish the dirt,” so to speak. It was delicious, as well as hilarious, as I recall. It’s kind of a thing for Maritimers to make the annual trek home at Christmas or in the summer. And it always seemed important to be home for Mum’s birthday. But please don’t get the idea that it was in any way a sacrifice for me. Ha. Quite the contrary. When we weren’t eating birthday cake on the day, Mum and I would shop ’til we dropped. In the evenings after supper, we’d binge on Jane Austen movies while my stepdad and Hubby would be banished to the kitchen. Which wasn’t exactly a sacrifice for them, either. Since the tea pot would be hot and there’d be a big cookie jar of homemade doughnuts. There were always homemade doughnuts. On one day Mum and I would trim her huge basil and parsley plants and I would make a big batch of pesto to take home. Hubby would pick wild chokecherries to bring home to make wine, and we’d otherwise pack the truck with goodies from the farm. Including a few doughnuts to keep our strength up for the long drive back to Ottawa. For several years Hubby and I combined the visit to Fredericton with a week on Prince Edward Island. One year we spent time in Maine. Another year we pulled our tent trailer all over Nova Scotia, camping on Cape Breton Island, and at Pugwash, Shelburne, Chester, Lunenburg, and Digby. Our own little east coast odyssey. In 2001 we headed over to Newfoundland for two weeks, taking the “slow ferry” from Sydney, landing in Argentia on the Avalon Peninsula at dusk and encountering a couple of moose almost right away, and even driving up the road behind a mother caribou and two babies the next morning, on our way to St. John’s, to stay with family for a few days. We ate fish and brewis, and cod au gratin, pronounced cod-A-grAten. I love my Newfie cousins, but they sure talk funny. Ha. We then pretty much circumnavigated the island, attending the Puffin Festival one night for a traditional Jiggs dinner in the village of Elliston which is, I’ll have you know, the self-proclaimed “root cellar capital of the world.” Loved that place. A few days later on the other side of the island we hiked up Gros Morne mountain, which was stunning, if a bit painful the next day, loose scree and new hiking boots being the culprit, before eventually leaving Newfoundland from Port Aux Basques by the “fast ferry.” We had to be back in Fredericton for Mum’s birthday. But not this year. Since I’ve been grounded by shingles, I’m not driving cars, and not even driving in cars, yet. So Hubby and I cancelled our trip to the Saguenay, and even our trip home to New Brunswick. And it feels weird to be here, on Mum’s birthday, when I know everyone else will be there. Okay, not everyone else. Mum doesn’t want a celebration, nor any “fuss” this year. Still, I know there’ll be a cake, and family dropping in. My cousin Marion will be bringing lunch, I heard. I’m sure my nieces, and Mum’s friends, and neighbours will stop by after supper with flowers and cards… and tasty tidbits. It’s not as if Mum will be on her own. Or that anyone will even notice that I’m not there. I do hate to miss a party. I posted this little video on Mum’s birthday a couple of years ago. Advice on aging. Have a look. Love the “stay weird” admonishment. Like in my family we have any choice. Ha. So… Happy Birthday Mum. Hope you have a grand day. Lots of hugs for your heart. Maybe a few books. Cake. And a great lunch with Marion. When I come home in November, we’ll go shopping for your birthday present. And watch Jane Austen movies until all hours. Linking up with Thursday Favourite Things. PrevPrevious storyOf Sweat Shirts, White Jeans, and Cross-Body Belly Packs. And a lot of shopping and Jane Austen films (I like them too) binge watching with Sue! I write funny,not like your Newfie realatives speak,but because I'm from Croatia,a little country in Europe (Where Mamma Mia 2-Here We Go Again,Game of Thrones and a lot of other films and series were filmed),but the wishes are from my heart and they are genuine! Thanks so much for the kind wishes, Dottoressa. Lovely to hear all about prior birthdays and visits to see your mum and how you’ve incorporated travel Sue, … good fun! Take care … I hope your need to stay at home will soon be over as I can guess you’re “itching” to travel again! Thanks, Rosie. I AM itching to get on the road…actually. It's a great video. I couldn't resist sharing it again. Sue, if you wrote a grocery list, I would read it. Happy birthday to your wonderful mother…. The video was a hoot!! Happy birthday to your mama. Thanks, Lisa. Starting to feel better this week. Even went walking and for coffee with my friends today! That felt sooo good. I bet it all goes swimmingly and you can reserve your strength for doughnuts later in the year. The thought of Sense and Sensibility in front of an autumnal fire is very appealing. Be sure to pack your thick pelisse. Ha. Had to look up "pelisse." Thought I knew what it was but wasn't sure. Oh my goodness, thanks for sharing the video. It made my day. And thanks for sharing at Thursday Favorite Things. Thanks, Pam. That little video is wonderful, isn't it? Thank you for posting that video, Susan… I was tearing up in places ! PS: Damn shingles to Hell ! Ha. Dam them to hell is about right. Thanks.